Many people over the past 2000 years have wondered what the MARK of the BEAST is. In order to understand this little understood subject, we must rely solely on the Scriptures. The MARK of the BEAST is mentioned in Revelation 13:16-18. 18Here is wisdom. 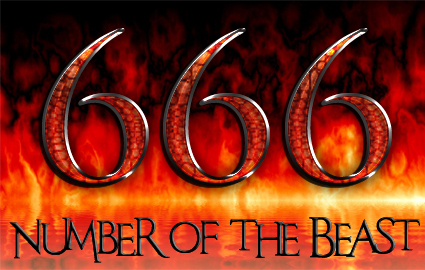 Let him that hath understanding count the number of the BEAST: for it is the number of a man; and his number is 666. Before we begin, let’s lay some ground work in order to understand prophecy according to the Scriptures. 21 For the prophecy came not in old time by the will of man: but holy men of Yahweh spake as they were moved by the Holy Spirit. Prophecy is not of any private interpretation so therefore we do not need some religious guru to help us understand prophecy. We simply need to go to the Sciptures and let the Scriptures interpret prophecy for us. 8 And I heard, but I understood not: then said I, O my Master, what shall be the end of these things? This tells us that only the WISE will UNDERSTAND prophecy, so let’s find out who the Scriptures say the WISE are. The Scriptures tell us that those who keep Yahweh’s COMMANDMENTS are the WISE. 13 Whoso despiseth the WORD shall be destroyed: but he that fears the COMMANDMENT shall be rewarded. 15 Good UNDERSTANDING giveth favor: but the way of transgressors is hard. 16 Every prudent man deals with KNOWLEDGE: but a fool lays open his folly. These Sciptures tell us that the WISE fear the COMMANDMENTS and the LAW of Yahweh and they also give both UNDERSTANDING and KNOWLEDGE. 10 The fear of Yahweh is the beginning of WISDOM: a good UNDERSTANDING have all they that do His COMMANDMENTS: His praise endures for ever. The Scriptures tell us here that those who fear Yahweh have WISDOM and those that do His COMMANDMENTS have UNDERSTANDING. 10 And he said unto me, Seal not the sayings of the prophecy of this book: for the time is at hand. The Prophet John tells us that prophecy was already being fulfilled in his day and the time was at hand. 2 Who bare record of the word of Yahweh, and of the testimony of Yahshua Messiah, and of all things that he saw. 3 Blessed is he that reads, and they that hear the words of this prophecy, and keep those things which are written therein: for the time is at hand. Again, John tells that the time was already at hand in his day. 17 And the dragon was wroth with the woman, and went to make war with the remnant of her seed, which keep the COMMANDMENTS of Yahweh, and have the testimony of Yahshua Messiah. John tells us that the dragon a.k.a. the devil is at war with those who keep the COMMANDMENTS of Yahweh and have the testimony of Yahshua. 10 And I fell at his feet to worship him. And he said unto me, See you do it not: I am your fellowservant, and of your brethren that have the testimony of Yahshua: worship Yahweh: for the Testimony of Yahshua is the Spirit of Prophecy. The Testimony of Yahshua is the Spirit of Prophecy. We are told here that the BEAST in Revelation 13 makes war with the SAINTS of Yahweh. Also, ALL people on Earth worship this BEAST, except those written in the Book of Life. The phrase PATIENCE of the SAINTS is mentioned here and will be explained next. 12 Here is the PATIENCE of the SAINTS: here are they that keep the COMMANDMENTS of Yahweh, and the faith of Yahshua. We are told here that all those who receive the MARK of the BEAST will receive the WRATH of Yahweh. We are also told what the PATIENCE of the SAINTS is. It is the keeping of the COMMANDMENTS of Yahweh and the faith of Yahshua. And I saw another sign in heaven, great and marvellous, seven angels having the seven last plagues; for in them is filled up the wrath of Yahweh. 2 And I saw as it were a sea of glass mingled with fire: and them that had gotten the victory over the BEAST, and over his image, and over his MARK, and over the number of his name, stand on the sea of glass, having the harps of Yahweh. 3 And they sing the song of Moses the servant of Yahweh, and the song of the Lamb, saying, Great and marvellous are your works, Yahweh Elohim Almighty; just and true are your ways, You King of SAINTS. 4 Who shall not fear you, O Yahweh, and glorify your NAME? for you only are holy: for all nations shall come and worship before you; for your judgments are made manifest. This tells us that the SAINTS get victory over the MARK of the BEAST. And I heard a great voice out of the temple saying to the seven angels, Go your ways, and pour out the vials of the WRATH of Yahweh upon the earth. All those that accept the MARK of the BEAST receive the WRATH of Yahweh and receive noisome and grievous sores. 18 That you may eat the flesh of kings, and the flesh of captains, and the flesh of mighty men, and the flesh of horses, and of them that sit on them, and the flesh of all men, both free and bond, both small and great. The BEAST is going to be completely destroyed at the soon return of the Messiah Yahshua. All who read this article will be blessed with the truth about this subject. In order to truly understand what the MARK of the BEAST is we must first understand who the BEAST is. Once we know who the BEAST is then we will know what his MARK is. In order to understand Revelation 13, we must first go back to Daniel 7. Belshazzar was a 6th century BC prince of Babylon, the son of Nabonidus and the last king of Babylon according to the Book of Daniel in the Hebrew Bible. In Daniel 5 and 8, Belshazzar is the King of Babylon before the advent of the Medes and Persians. Although there is evidence that Belshazzar existed, his famous narrative and its details are only recorded in the Book of Daniel, which tells the story of Belshazzar seeing the writing on the wall. Belshazzar was the son of Nabonidus, who after ruling only three years, went to the oasis of Tayma and devoted himself to the worship of the moon god Sin. He made Belshazzar co-regent in 553 BC, leaving him in charge of Babylon’s defense. In 540 BC, Nabonidus returned from Tayma, hoping to defend his kingdom from the Persians who were planning to advance on Babylon. Belshazzar was positioned in the city of Babylon to hold the capital, while Nabonidus marched his troops north to meet Cyrus. On October 10, 539 BC, Nabonidus surrendered and fled from Cyrus. Two days later the Persian armies overthrew the city of Babylon. The Great Sea or Mediterranean Sea is a sea connected to the Atlantic Ocean surrounded by the Mediterranean region and almost completely enclosed by land: on the north by Europe, on the south by Africa, and on the east by Asia Minor. The term Mediterranean derives from the Latin word mediterraneus, meaning “in the middle of earth” or “between lands”: as it is between the continents of Africa, Asia and Europe. The Mediterranean Sea has historically had several names. For example the Romans commonly called it Mare Nostrum (Latin, “Our Sea”). In the Bible, it was primarily known as HaYam HaGadol or The Great Sea, (Num. 34:6,7; Josh. 1:4, 9:1, 15:47; Ezek. 47:10,15,20:Daniel 7:2. 49 Yahweh shall bring a nation(Babylon) against you from far, from the end of the earth, as swift as the EAGLE flies; a nation whose tongue you shall not understand. So now from Scripture we know who was the first LION beast with EAGLE’S wings. The Babylonian Empire ruled from the GREAT SEA and Palestine to Syria to Mesopotamia and to the Persian gulf from 604 B.C. – 539 B.C. And behold another SECOND BEAST, like to a BEAR, and it RAISED ITSELF UP ON ONE SIDE, and it had THREE RIBS in the mouth of it between the teeth of it: and they said thus unto it, Arise, devour much flesh. The medo-Persian Empire is compared to a bear because the number one way of attack for the Persian brown bear is to attack the HEAD. According to Daniel, the Babylonian kingdom was the HEAD of gold to be attacked. And wheresoever the children of men dwell, the beasts of the field and the fowls of the heaven hath he given into your hand, and has made you ruler over them all. You(babylon) are this HEAD of gold. The Medo-Persian Empire conquered the Babylonian Empire in 539 B.C. The Medo-Persian Empire ruled from 538 B.C. – 330 B.C. It stretched from the GREAT SEA and Egypt to Palestine to Syria and Asia Minor to Mesopotamia to Persia. After this I beheld, and another, like a LEOPARD, which had upon the back of it FOUR WINGS of a fowl; the BEAST had also FOUR HEADS; and dominion was given to it. The Grecian Empire led by Alexander the Great conquered the Medo-Persian Empire in 330 B.C. The Greek Empire stretched from the GREAT SEA from Egypt to Palestine to Syria to Asia Minor to Greece to Mesopotamia to Persia to India. The symbol of the LEOPARD with FOUR WINGS is used because of the great speed at which the Grecian Empire conquered the world. It took Alexander the Great just 13 short years to conquer the entire known world. The cheetah is a spotted feline like the LEOPARD and is the fastest land animal in the world. It has a top speed of 70mph. The FOUR HEADS represent the FOUR KINGDOMS that the Grecian Empire divided into after Alexander the Great’s death in 323 B.C. The Greek Empire ruled from 330 B.C. – 30 B.C. In 30 B.C., the Roman Empire finally conquered Egypt and the last Ptolemy, Cleopatra. Egypt was the last of the FOUR HEADS of the Grecian Empire to be conquered by Rome. The Roman Empire ruled the entire GREAT SEA area. The Roman Empire ruled supreme from 30 B.C. until 476 A.D. In 476 A.D. the Roman Empire was invaded and conquered by barbarian tribes. The Roman Empire divided into TEN KINGDOMS which are the TEN HORNS. These empires went on to conquer the globe. The British Empire conquered 25% of the Earth and it was said, “The Sun never sets on the British Empire.” The French Empire at one time controlled half of North America, half of Africa, 25% of Europe, India, S.E. Asia, Madagascar, as well as other areas. The Portuguese Empire took half of South America, parts of Africa, as well as other small colonies. The Spanish Empire conquered half of North America, half of South America, parts of Africa, and some islands in the Pacific. The Italian Empire took North Africa and other parts of Africa. The Byzantine Empire controlled the former Eastern Roman Empire and later the throne transfered to Russia when the Muslims took Byzantium. The Russian Empire controlled N.E. Europe and half of Asia. Switzerland never became an imperialist nation and so it only remained in Switzerland. The Ostrogoths, Heruli, and the Vandals were destroyed and uprooted. The THREE HORNS or THREE KINGDOMS that were plucked up by the roots are the Ostrogoths, Heruli, & Vandals. The remaining SEVEN HORNS went on to conquer the globe. The LITTLE HORN that came up among the TEN HORNS is the Pope and the Papacy. This happens at the second coming which is soon to occur in our lifetime. This is a prophecy of the future final destruction of the Pope and the Roman Church. Again this is speaking of the Age of Revolution when the monarchies were put down, but the 7 remaining horns remain now as democracies and republics. 14And there was given him dominion, and glory, and a kingdom, that all people, nations, and languages, should serve him: his dominion is an everlasting dominion, which shall not pass away, and his kingdom that which shall not be destroyed. This speaks of the soon coming fulfillment of the return of the Messiah and the setting up of the Millenial Kingdom here on Earth. This is Daniel talking with angel to gain more understanding. We already know who these 4 Kingdoms are: Babylon, Medo-Persia, Greece, and Rome which divided into 10 and 7 of these divisions are still with us today. But the saints of the most High will take the kingdom when Yahshua retuns in the next few years. These verses speak of the Roman Empire and its later division into 10 and the Little Horn ie. the Pope and his kingdom. He had a look more stout than his fellow kings in that he was not a secular king, but a religious king. During the Holy Roman Empire, which we will discuss shortly, the Pope was more powerful than his other fellow kings. Those verses speak about the Pope and the Roman Church persecution of Yahweh’s true believers or saints. If someone didn’t obey the dictates of the Roman Church they could be persecuted, have their property confiscated, tortured, or even killed. Fox’s Book of Martyrs by John Foxe gives some information about this. Also, you can study about the Spanish Inquisitions and the Dark Ages as well. 2) The Roman Catholic Church has changed the Sabbath to Sunday. 3) The Roman Church does not keep any Biblical Feast Days, but keeps Babylonian Holidays instead such as Christmas, Easter, & Sunday. 4) The Pope claims to be the Antichrist, ie. The Vicar of the Son of God. 5) The Pope and the Roman Priests claim to be able to forgive sins. Only Yahweh can forgive sins. 6) The Pope claims to be able to change Yahweh’s Laws. Yahweh tells us in Deuteronomy not to add or take away from His laws. All of these things are the Pope claiming he has the power to change Yahweh’s Appointed Feasts and Laws. Which is exactly what Daniel says he would do, “think to CHANGE TIMES AND LAWS.” The three and a half times are 3.5×360=1260 prophetic days which are 1260 years. This is the time period from 538 A.D. until 1798 A.D. when Napoleon ended the Pope and the Papacy. Ezekiel 4 is where we find out that each day represents a year. Yahweh reminds us here that the kingdom will soon be taken away from Rome and its Roman Church and given to the saints of the most High. Here we have the Prophet John picking up and confirming what the Prophet Daniel was saying about the Roman beast rising up out of the Great Sea and having 10 horns. he adds a new element by telling us that Rome also has 7 heads. in Revelation 17 we find out that the 7 heads are 7 mountains on which Rome sits. Rome is know as the City of Seven Hills. There are also 7 kings that represent the 7 heads. We are told that Babylon was 1 head and Greece was 4 heads for a total of 5 heads. Then later we are told that Rome is the 6th head and that there would be a seventh head. Daniel 7:20 “And of the ten horns that were in his HEAD…” Remember Rome had the 10 horns and now we are told that they were in his HEAD. The head that was wounded to death and then healed was the Roman Empire that divided into 10 separate kingdoms in 476 A.D. By obeying the false religious system of Rome and its false religious worship system you are worshipping the Dragon a.k.a. Devil a.k.a. Satan. 6 And he opened his mouth in blasphemy against Yahweh, to blaspheme his name, and his tabernacle, and them that dwell in heaven. 1) The Pope speaks blasphemies when he puts himself in the place of Yahweh by changing the appointed times and laws of Yahweh and forgiving sins. 2) 42 months = 42×30=1260 prophetic days = 1260 years from 538 A.D.-1798 A.D.
3) During the Dark Ages the Roman Church and the Pope persecuted and killed millions of Bible believing saints. 4) Both Roman Catholics and her Protestant daughters worship the Pope and the Roman Church by keeping its times and laws instead of worshipping Yahweh by keeping His appointed times and laws. 5) The Pope was removed from power by the sword and taken into captivity in 1798 A.D. by the French Emperor Napoleon. 1) After the Roman Empire received the deadly wound in 476 A.D., it slowly began to revive into 2 horns or kingdoms. One of these kingdoms was known as the Holy Roman Empire, which reigned in Rome from 800 A.D. until 1806 A.D. The other kingdom was known as the Byzantine Empire, which reigned in Byzantium from 476 A.D. until 1453 A.D. After 1453 A.D., the kingdom transferred to Russia from 1453 A.D. until 1917 A.D.
2) These 2 horn kingdoms were like a lamb in that they claimed to be Christian and represent the Lamb on earth, but they spoke as a Dragon because they deceived the world into keeping the Babylonian Holidays of Christmas, Easter, Sunday, etc. The territory that once belonged to the Roman Empire was now being controlled by the 2 horns or kingdoms of the Holy Roman Empire and the Eastern Orthodox Byzantine Empire. 1) The WORD of Yahweh is the FIRE that came down from HEAVEN and the 2 horned beast uses it to deceive people. Deuteronomy 4:36 Out of HEAVEN he made you to hear his voice, that he might instruct you: and upon earth he showed you his great FIRE; and you heard his WORD out of the midst of the FIRE. 2) The image of the beast is the new religious Roman Empire that replaced the old Roman Empire which had the wound by a sword. The new religious Roman Empire was made up of the Holy Roman Empire in the west and the Eastern Orthodox Byzantine Empire in the east. Images also called idols were used by the Pagans to worship their gods. This new religious 2 Horned Beast demanded worship from its subjects and was an image of the former Roman Empire that was brought to an end in 476 A.D. by the barbarian tribes. Both the Holy Roman Empire and the Byzantine Empire forced their doctrines of worship upon the whole world. Those that did not conform were both persecuted and killed. 18 Here is wisdom. Let him that hath understanding count the number of the beast: for it is the number of a man; and his number is 666. 1) This 2 horn lamb-like beast has caused the whole world to receive this MARK in the HAND and FOREHEAD. 3) Only those with wisdom and understanding can count the number of the beast. The number of the beast is a number of a man and his number is 666. And Yahweh said unto him, Therefore whosoever slays Cain, vengeance shall be taken on him sevenfold. And Yahweh set a MARK upon Cain, lest any finding him should kill him. The Hebrew word for “MARK” is #226 in the Strong’s Exhaustive Concordance and is pronounced “owth.“ It is translated this one time as “MARK” and the rest of the time it is translated something else which has caused confusion. It is translated as the Engish word “SIGN” 60 times. When we do a search for both the word “SIGN” and “HAND” we come up with a few scriptures for reference. And it shall be for a SIGN unto you upon your HAND, and for a memorial between your eyes, that Yahweh’s LAW may be in your mouth: for with a strong hand hath Yahweh brought you out of Egypt. Now, lets correct the translation with the correct word “MARK” for clarification. Also, the Hebrew phrase, “between your eyes” means FOREHEAD so we will put this word in as well. And it shall be for a MARK upon your HAND, and for a memorial on your FOREHEAD, that Yahweh’s LAW may be in your mouth: for with a strong hand hath Yahweh brought you out of Egypt. 2 That you might fear Yahweh, to keep all his statutes and his commandments, which I command you, and your son, and your son’s son, all the days of your life; and that your days may be prolonged. 3 Hear, O Israel, and observe to do it; that it may be well with you, and that you may increase mightily, as Yahweh of your fathers has promised you, in the land that flows with milk and honey. 5 And you shall love Yahweh with all your heart, and with all your soul, and with all your might. 7 And you shall teach them diligently unto your children, and shall talk of them when you sit in your house, and when you walk by the way, and when you lie down, and when you rise up. 8 And you shall bind them for a SIGN(MARK) upon your HAND, and they shall be as frontlets between your eyes(FOREHEAD). 17 And then Yahweh’s wrath be kindled against you, and he shut up the heaven, that there be no rain, and that the land yield not her fruit; and lest you perish quickly from off the good land which Yahweh gives you. 18 Therefore shall you lay up these my words in your heart and in your soul, and bind them for a SIGN(MARK) upon your HAND, that they may be as frontlets between your eyes(FOREHEAD). And that no man might BUY or SELL, save he that had the MARK, or the name of the beast(Rome), or the number of his name(666). BUY the truth, and SELL it not; also wisdom, and instruction, and understanding. Who do you know that is in the business of buying and selling Yahweh’s truth? Notice the 5 wise virgins told the 5 foolish virgins to go to those who SELL oil and BUY it. We are not talking about real oil here, but rather this is spiritual oil that can only be found at a spiritual store ie. a church, synagogue, etc. Those who “BUY and SELL” are the priests, preachers, and rabbis. Here is WISDOM. Let him that hath UNDERSTANDING count the number of the beast(Rome): for it is the number of a man; and his number is 666. The fear of Yahweh is the beginning of WISDOM: a good UNDERSTANDING have all they that do his commandments: his praise endures forever. According to Scripture, the WISE are those who fear Yahweh and those with UNDERSTANDING are those that keep His Commandments. The Saints are the ones who keep the Commandments of Yahweh. We know the beast is Rome and the Holy Roman Empire. We know the number of the beast is 666. But what is the number of a man that is also 666? ROMULUS was the first king of Rome and it was after him that the city of Rome and later the Roman Empire was named. The Greek name for Romulus was LATEINOS. Also, the Hebrew spelling for Saturn also equals exactly 666. The numeric equivalents of Hebrew letters can be found in the Encyclopedia Britannica under “Languages of the World”, Table 50. Both the Greeks and Hebrews used letters for their numbering system. In conclusion, by the faithful interpretation of the Scriptures one can discover who the BEAST(Rome) is and also what his MARK(Times & Laws) is. The world today have both the Roman Empire and the Roman Church to thank for our modern day calendar. Julius Caesar of the Roman Empire gave us the Julian calendar which was in use from the 1st century B.C. until the 16th century A.D. In the 1500′s, Pope Gregory of the Roman Church gave us the current Gregorian calendar which the world uses today. Instead of using the Creator Yahweh’s calendar found in the Scriptures, we use the Roman calendar which includes the names of Pagan gods for the names of the days of the week and for the names of the months of the year. This calendar also contains the Babylonian Holidays such as Sunday, Easter, Christmas, etc. Instead of following Yahweh and His Appointed Holy Days, the world follows the Roman Beast and its pagan holidays. To everyone concerned, please let me apologize upfront if I hurt anyone’s feelings with the following information. My intent is not to hurt, but to simply inform. Please take the time to read all the information before jumping to any conclusions. I am simply a messenger trying to convey the Truth. Antiochus IV Epiphanes ‘God Manifest’ c. 215 BC – 164 BC) ruled the Seleucid Empire from 175 BC until his death in 164 BC. His original name was Mithridates(Named after Mithra); he assumed the name Antiochus after he ascended the throne. Royal names incorporating Mithra’s (e.g., “Mithradates”) appear in the dynasties of Syria, Parthia, Armenia, Anatolia, Pontus and Cappadocia. Pagan royalty named themselves after the gods they worshipped. Mithra’s holiday was celebrated on December 25th or December 26th depending on the day of the winter solstice. In modern times the winter solstice can fall on either December 21st or December 22nd. 54 On the 15th day of the month of Kislev in the year 145(Seleucid Era),King Antiochus set up the Awful Horror on the altar of the Temple, and pagan altars were built in the towns throughout Judea. The year 145 of the Seleucid Era corresponds to October 168 B.C.E.-September 167 B.C.E. 59 On the 25th day of Kislev, these same evil people offered sacrifices on the pagan altar erected on top of the altar in the Temple. In 168 B.C.E. the new moon of Kislev fell on December 1st and the 25th day of Kislev fell on December 25th ie. Mithra’s holiday when Antiochus Epiphanes sacrificed a swine in the Temple of Yahweh. The book of Maccabees ADMITS that the first day of Hanukkah is on the EXACT SAME DAY as Antiochus Epiphanes kept Mithra’s holiday and sacrificed swine in the Temple of Yahweh. The only difference is that the lunar calendar does not always fall on the same day of the solar year. 52-54 The 25th day of the ninth month, the month of Kislev, in the year 148(Seleucid Era) was THE ANNIVERSARY OF THE DAY THE GENTILES DESECRATED THE ALTAR. On that day a sacrifice was offered on the new altar in accordance with the Law of Moses. The new altar was dedicated and hymns were sung to the accompaniment of harps, lutes, and cymbals. 55 All the people bowed down with their faces to the ground and worshiped and praised the Lord for giving them victory. In Zoroastrian/Iranian tradition, Mithra became the divinity of the Sun. How, when or why this occurred is uncertain, but is attributed to a conflation with the Babylonian SHAMASH, who – in addition to being a Sun god – was a judicial figure like Mithra. 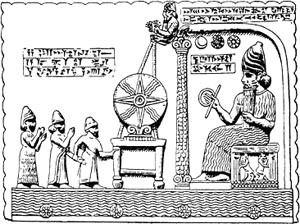 Shamash was a native Mesopotamian deity and the sun god in the Akkadian, Assyrian, Canaanite, Hebrew, and Babylonian pantheons. Shamash was the god of justice in Babylonia and Assyria. The Hanukkah festival is observed by the kindling of the lights of a unique candelabrum, the nine-branched Hanukiah, one additional light on each night of the holiday, progressing to 8 on the final night. The typical Hanukiah consists of eight branches with an additional RAISED branch in the middle. The extra light is called the SHAMASH and is GIVEN A DISTINCT LOCATION, usually ABOVE the rest. The SHAMASH sun god candle is elevated above all the others. In conclusion, the 25th of Kislev fell on December 25th in the year 168 B.C.E. when Antiochus Epiphanes aka. Mithradates worshipped Mithra aka. SHAMASH. Sadly, today most Jews and Messianics celebrate this exact same day, Kislev 25, and also use the SHAMASH to celebrate it. Although Kislev 25 on the lunar calendar does not fall on the winter solstice every year, it did so in the year 168 B.C.E. when Antiochus Epiphanes sacrificed unto Mithra. True believers should not mix anything that is associated with a pagan holiday with the worship of Yahweh. Please again forgive me, if I seem to come across wrong, but I just want you to be informed with the Truth. The Truth will make us free. 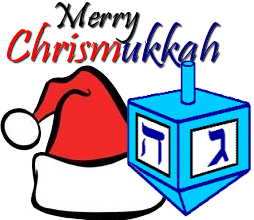 Peace and Blessings to you and yours! *The primary root word for SUN in the Hebrew is #8121 of the Strong’s Exhaustive Concordance. It is pronounced exactly the same in both the Hebrew and Chaldean/Babylonian, “SHEMESH.” The primary root word for SERVANT/ATTENDANT in the Hebrew is #5647 in the Strong’s Exhaustive Concordance. It is pronounced exactly the same in both the Hebrew and Chaldean/Babylonian, “AWBAWD.” “Shamash” is the most popular transliteration used and that is why I chose it. *Some things to take into consideration when calculating moon phases thousands of years ago is that it is not an exact science as NASA plainly admits on their website. “The last column of the phase table lists ΔT, the value used to convert Dynamical Time to Universal Time. The uncertainty in the value of ΔT grows large for dates in the distant past or future.” ” The uncertainty in the value of ΔT is of particular interest in the calculation of eclipse paths in the distant past and future. Unfortunately, estimating the standard error in ΔT prior to 1600 CE is a difficult problem. It depends on a number of factors which include the accuracy of determining ΔT from historical eclipse records and modeling the physical processes producing changes in Earth’s rotation.” The ΔT for the 168 B.C.E. is 3 hours and 27 minutes. Also, all the dates before 1582 C.E. are according to the Julian Calendar system. “The old style Julian calendar is used for dates prior to 1582, while the modern Gregorian calendar is used after that date.” A third thing to realize is that a visible crescent moon may be observed as early as 13.5 hours with lenses and 15.5 hours with the naked eye. http://moonsighting.com/faq_ms.html In 168 B.C.E. the new moon happened at 02:49 or 2:49a.m. on December 1st, 168 B.C.E. Being that it is possible to observe the new moon crescent in as little as 13.5-15.5 hours after the conjunction, then the new moon crescent could have been observed at sundown on December 1st, especially taking into consideration 3 hours and 27 minutes for ΔT. However, the new moon crescent would have definitely been observable on the following sundown on December 2nd being that it had at least 40 hours to mature after conjunction. This would place Kislev 25 on December 26 which is a viable candidate for the winter solstice and the Mithra holiday. Shalom!